This has made it onto my “Top 10 Favorites lists. If you eat it warm the day you make it and top it with a warm caramel sauce, you’ll have Sticky Toffee Pudding . BUT if you wrap it in foil and refrigerate over night you will have a lovely dense breakfast loaf that you cannot top! Except with cream cheese of course!! Cut dates into small pieces. Place into a medium bowl and cover with boiling water. Stir in sugar and butter. Cool and stir in beaten egg. Sift flour, baking soda and salt together. Stir into date mixture until blended. Pour into greased loaf pan and let stand for 15 minutes. Bake for 1 hour and 10 minutes.Test for doneness at 1 hour. Cool in pan for 5 minutes. Turn out onto wire rack. Cool. Wrap in foil and refrigerate overnight. 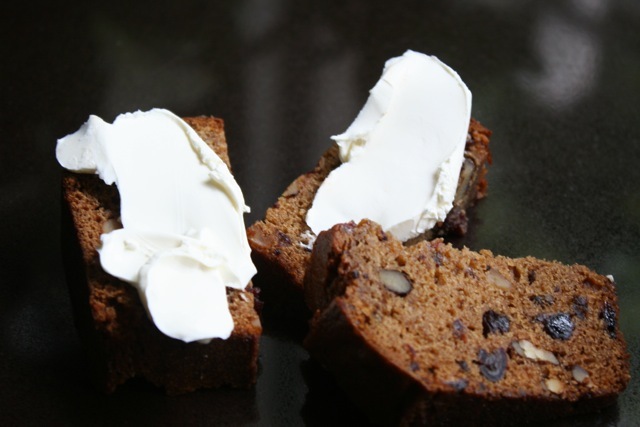 This entry was posted on Friday, May 11th, 2012 at 3:01 am	and tagged with breakfast, date tea bread, english, nut bread, recipe, Tea and posted in Category. You can follow any responses to this entry through the RSS 2.0 feed.